Edgar Allan Poe wrote his great works while living in several cities on the East Coast of the United States, but Baltimore's claim to him is special. His ancestors settled in the burgeoning town on the Chesapeake during the 18th century, and it was in Baltimore that he found refuge when his foster family in Virginia shut him out. Most importantly, it was here that he was first paid for his literary work. If Baltimore discovered Poe, it also has the inglorious honor of being the place that destroyed him. On October 7, 1849, he died in this city, then known as "Mob Town." 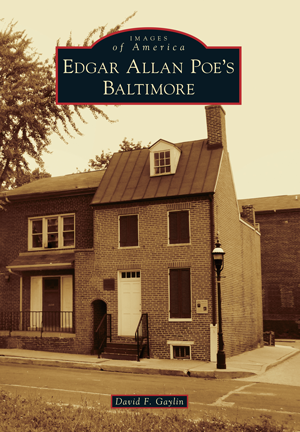 Edgar Allan Poe's Baltimore is the first book to explore the poet's life in this port city and in the quaint little house on Amity Street, where he once wrote. In partnership with Poe Baltimore, the caretakers of the Edgar Allan Poe House, lifelong Poe student and Baltimore native David F. Gaylin has assembled a collection of archival, rarely seen images to re-create a picture of the antebellum town that Poe walked through every day.